Hi there! I'm Rev Misty! All major religions and societies agree forgiveness is a good idea. But what they haven’t taught us is how to forgive. Rev. 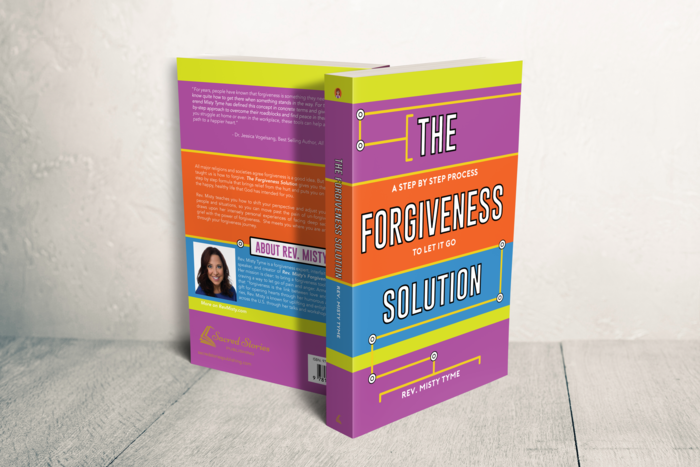 Misty’s Forgiveness Algorithm™ gives you the how in a proven step by step formula that brings relief from the hurt and puts you on the road to living the happy, healthy life that God has intended for you. Rev. Misty teaches you how to shift your perspective and adjust your expectations of people and situations, so you can move past the pain of un-forgiveness. Rev. Misty draws upon her intensely personal experiences of facing deep sadness, anger and grief with the power of forgiveness. She meets you where you are and helps you walk through your forgiveness journey. Get Forgiveness Tips Straight to your Inbox! Sign up with your email address to receive the latest and greatest from Forgiveness Expert, Reverend Misty Tyme. Rev. Misty Tyme is a forgiveness expert, author, speaker and creator of The Forgiveness Algorithm™. Rev. Misty was ordained in 2015 after spending two years in One Spirit Interfaith Seminary. Previously, she had a long successful career in corporate health care. Rev. Misty lives in Boise, Idaho, and San Diego, California and is a wife and mother of six children.